In the heart of the medieval city, the Collegiate Church built in the twelfth century, is among the jewels of Roman Art. The chevet strikes by the harmonious staging of volumes and the richness of the carved decoration. 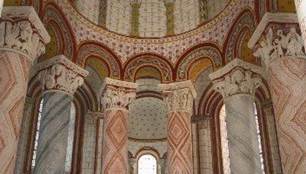 Note that the curved crown walls that crown the apse and the radiant chapels are not domes but simple low walls that conceal the tiled roof. 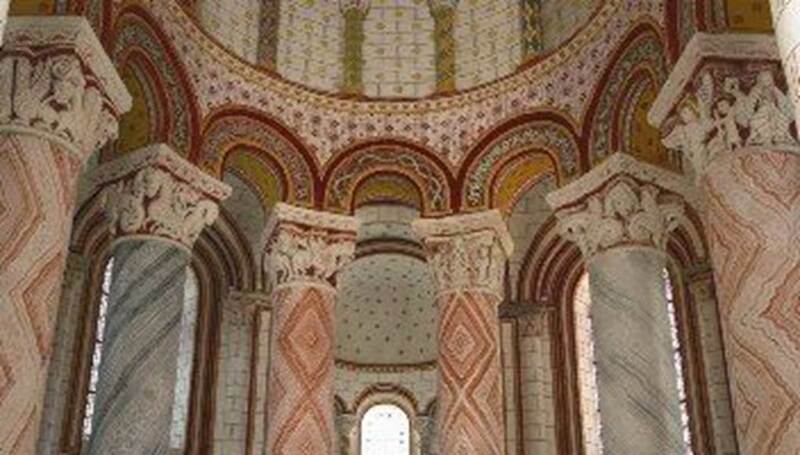 The interior is striking by the elevation of the vaults which gives the monument lightness and light. All the wealth is gathered in the choir. The capitals of the chevet are world famous: one sees various episodes of the life of the Virgin and Jesus, as well as a profusion of animals and monsters. The author of these scenes, a certain Gofridus, whose signature appears on the capital of the adoration of the Magi, shows here a powerful verve and a naive expressiveness. free visit, guided tours: at fixed times for individuals and, for groups, by reservation all year round, at the museum and heritage department of Chauvigny:information, rates, conditions and reservations on 05 49 46 35 45.